Gently spiced king prawns in a light, golden coating make an impressive but simple starter or light lunch. Serve on a large platter with lime wedges. Mix the lime juice, garlic, chilli, ginger and turmeric in a large bowl and leave to infuse for a couple of minutes. Pat the prawns dry with kitchen paper. Using a sharp knife, make a small incision along the back of each prawn to remove the black vein. Place the prawns in the lime marinade and mix with a fork (to avoid staining your hands with turmeric). Cover and chill for about 30 minutes. Sift the cornflour onto a large plate. Add half of the prawns to the cornflour and coat lightly. Heat 3 tablespoons of the oil in a large frying pan and fry the coated prawns for about 3 minutes, turning occasionally, until just cooked and crisp. Drain on kitchen paper then cover with foil to keep warm. Coat the remaining prawns with cornflour and fry in the remaining oil. Garnish with the coriander and serve immediately with extra lime wedges and a sprinkling of sea salt. 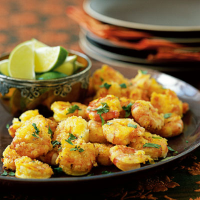 To ensure a crisp coating, the prawns should be fried immediately after being dipped in the cornflour.